What you really need to be ready for birth. Reader emails from around the world, like the one copied below, provide an opportunity to contrast our experiences with pregnancy here in the United States with those of women from other cultures and parts of the world. This reader asked that I not use her name. She has lived in the US one year. The subject line read: Urgent advice needed. How are you doing? I am from India residing in California. I am totally LOST and I really do not have any clue about how it works here when it comes to deliver a baby. In the USA, things are pretty different from India. I didn't even know that I needed to get registered with a hospital and decide the name of the baby before I get discharged. What all things should I do and what all things do I need to know, as I am due in November. Time is approaching and I am not sure if I have taken care of everything. Please advise and tell me what all things to do before and after delivery. Honey, let me reassure you, as long as you have a doctor or midwife taking care of you during your pregnancy, that's all you really need. I know childbirth "American style" can be overwhelming. We give the impression you have to own lots of stuff and learn everything there is to know well in advance of your baby's birth. Really, all you need is good prenatal care, a safe, nurturing home, a pile of diapers and a few baby clothes. Everything else is non-essential and you have time to fill in the details later. If you don't have a doctor/midwife yet, that's your first order of business. Ask friends, family or those who helped with your immigration to connect you with a health care provider. Or, call the local hospital and ask for a mother-baby patient-services case manager. They'll guide you along the healthcare and paperwork trail so you'll be prepared for a safe birth. But, even if you did nothing in advance and just showed up at a hospital in labor (which is common practice in many parts of the world), the hospital staff would take care of you and help you with registration, baby-care education and paperwork. Now, about that baby name myth: You don't have to name your baby before discharge. Many people can't decide or come from cultures where the name is chosen after birth. You have the right to name your child when you're darn good and ready. I've had patients from other countries who thought we'd name their baby if they didn't. I even had one who thought we'd named her baby FEMALE (pronounced famolly). Don't worry about that. Take your time. My reader from India can relax knowing everything she really needs is available in a clean, safe place where doctors and midwives have every medical supply at their fingertips to make sure she delivers safely. My friends at CARE sent me a note yesterday about a 20-year old woman, currently 8 months pregnant in Pakistan. I know no heart is more tender or generous than a parent's. Fit Pregnancy readers reached out and helped pregnant women when the earthquake hit in Haiti. I'm hoping this story will inspire you to help pregnant women (due at the same time as some of you) in Pakistan too. In 104-degree heat with unbearable humidity, 22 million people fled for their lives in the wake of one of the worst natural disasters the world has ever seen. 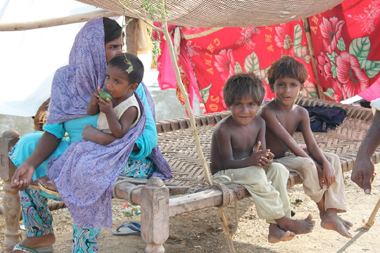 In southern Punjab, thousands of families' homes are now underwater. About a hundred traveled to a dry area in a small forest, near a busy, noisy road; many kilometers from their village and hours from the closest hospital. Among them is Balquis, due in October with her first baby. Balquis, sits on a kind of camp bed (several ropes strung between wood). She can lie down from time to time to relax but, this is hard for a pregnant woman to endure. Her young husband rests next to her, very sick (waterborne disease is epidemic here). Balquis says, "He has fever. He would love to support me, but he is too weak." 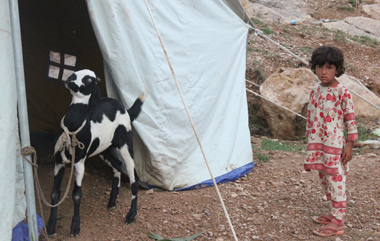 Goats, cows, cats and people crowd together between cots. Excrement is everywhere. "It will be a boy," Balqis smiles, as sweat beads on her upper lip. If it's a girl, we will be pleased too." Now, crowded into a makeshift camp she says, "I don't know where I can give birth. I don't know how it will be." 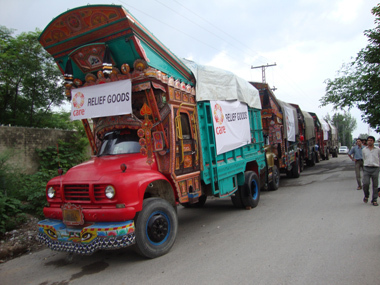 CARE was already in Pakistan before the flood struck, developing healthcare, microfinance, education and food programs. They jumped into action setting up tent cities, providing clean water and emergency food and medical care. 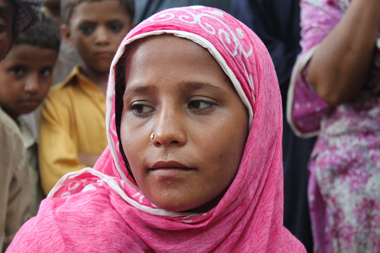 Now, CARE is working with local aid agencies to get immediate help for women like Balquis. All pregnant women will be brought to a hospital where they'll be provided shelter, nutrition, clean water, hygiene and health care. CARE is helping make Balquis' life and birth safe and dignified. Log on to CARE to find out how you can help. It kind of puts it all in perspective, doesn't it? We have it so good here.